Just 4 miles to the north of Hartlepool lies the former colliery village of Blackhall and Blackhall Rocks, at the southern extent of the Northumberland and Durham coalfield, and what a place it is! In my initial blog I said that the sort of places I painted were not celebrated places. 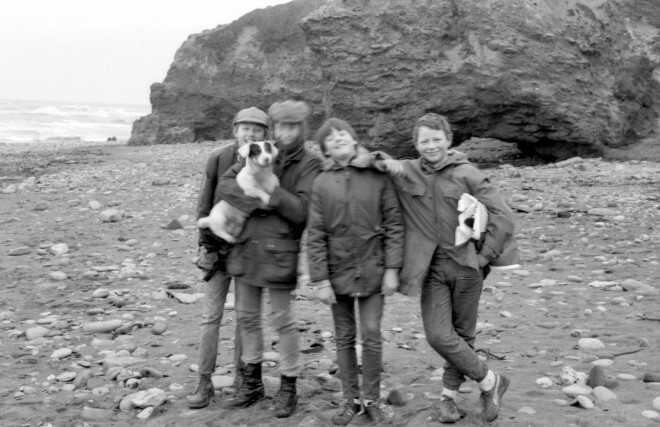 Well, for a day or two, back in 1971 (I think), Blackhall Rocks was indeed a celebrated place. Graced by the presence of Michael Caine, the beach was the location for the final scene of the much-revered film ‘Get Carter’. 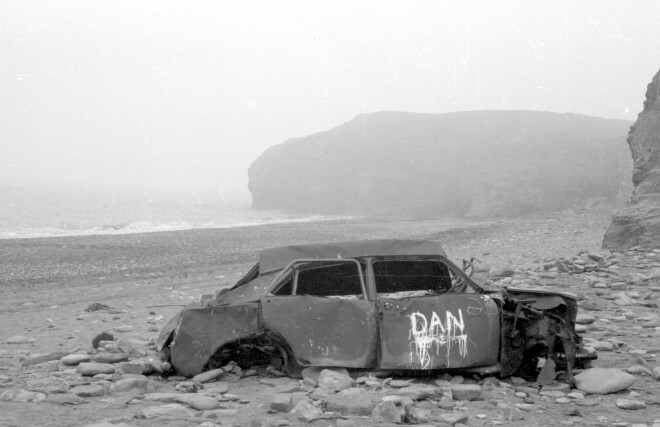 I don’t think Blackhall Rocks is ever going to rival Malibu, Cannes or Acapulco for movie star spotting; the beach at Blackhall Rocks was chosen as a bleak, desolate and sinister, industrial wasteland; a fitting finale for the plot of a dark, gangland killing. 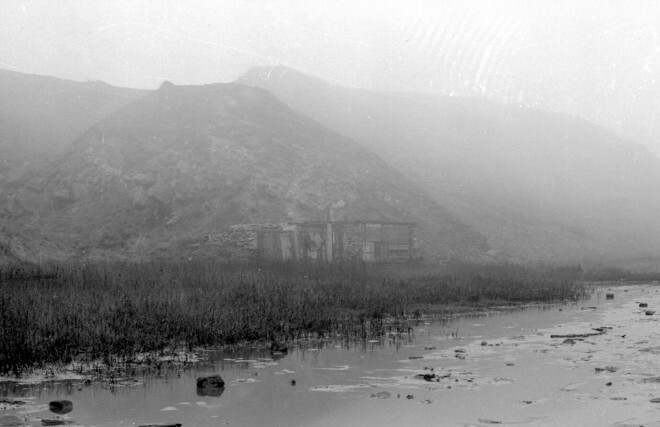 Timber hut (since destroyed). Blackhall Rocks 1973. Bleak and desolate and a place to avoid is the popular view, but it is not mine; I saw it differently. Sea stack and layers of industrial waste. Blackhall Rocks. 1973. To me it was extremely atmospheric, a wonderful place to comb, a place for local characters only, and admittedly, on occasion, it would feel slightly threatening. Yes, it was a beach covered in industrial waste from irresponsible, indiscriminate tipping from the adjacent coalmine, it was littered with burned-out cars, shopping trolleys and other scrap; there was stuff that it was probably best to remain ignorant of; but it interested me. Burned out car. Blackhall Rocks 1973. 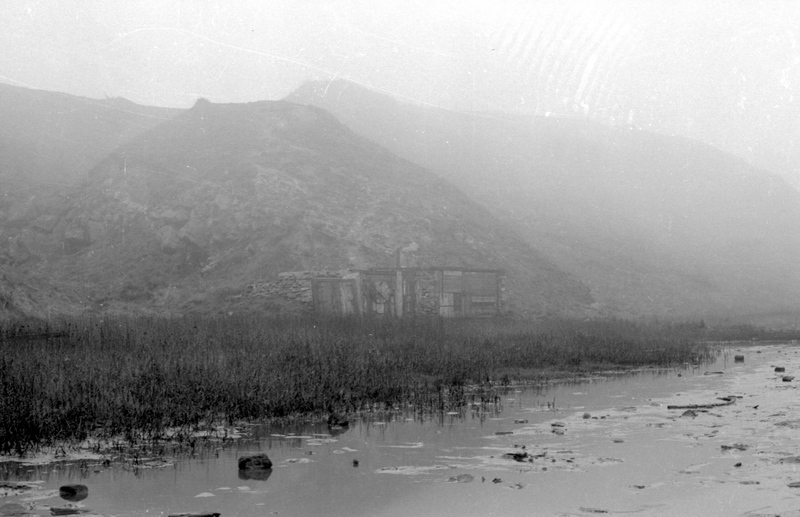 It interested me because here there existed a microcosm; there were men who scraped a livelihood from the place – collecting coal to keep their families warm and selling any surplus to buy food; collating bundles of scrap and cashing it in, picking up wood to repair allotments, or fishing for codling and mackerel from the shore. 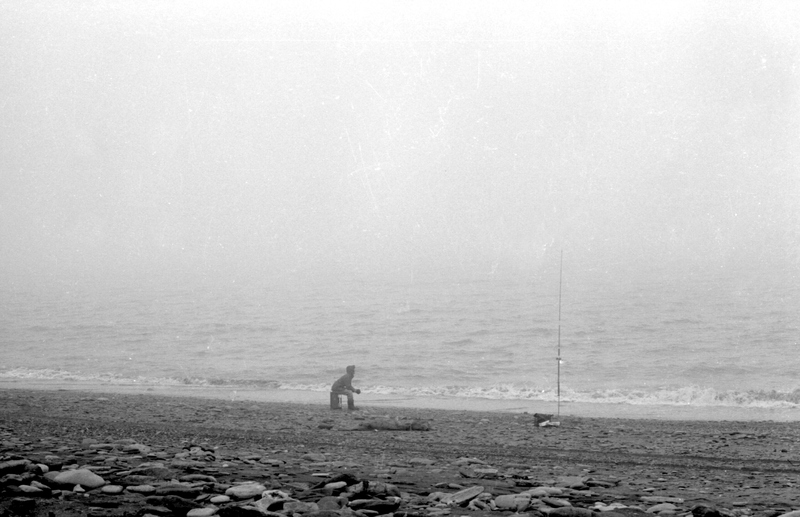 Shore Fishing. Blackhall Rocks 1973. These men didn’t discuss their low carbon footprint at dinner parties but, out of necessity, they were the most efficient re-cyclers, responsible for cleaning up the excesses of a profligate society. They were tough men, scraping together heavy sacks of wet coal, hauling them up a slippery, tortuous cliff path, and pushing them home on the crossbar of a bicycle, sometimes four sacks high, each hessian sack leaking seawater into their boots, through their socks and between anaesthetised toes – their fingers numbed by a cutting north east wind, thrusting sleet through the fibres of their clothing, and penetrating their very being – leaving them thoroughly sapped, their sinews exhausted in the quest to survive; the only remedy is humour. ‘Y’aal reet Tommy?’ ‘Bloody champion son, nivvor bettor!’ ‘Canny day like.’ Aye, not so bad.’ The skin on my face was stinging, and my eyes watering. Here lies the basis of much of what I like about the prevailing attitude in the North East. For many, life can be hard, but on the face of it, it is not taken so seriously. Traditionally there is inter-dependence in order to survive. In the mines, the steelworks and the shipyards, you work together with your colleagues for your safety, in order to achieve a level of pride in your work, and to earn bonuses. You don’t, like a stockbroker, compete in order to survive. The consequence of this is that people are more likely to speak to you in a public place, treat you with genuine warmth, and communicate with humour and a lightness of being. Strangers on the Shore. Four lads with a spark about them. 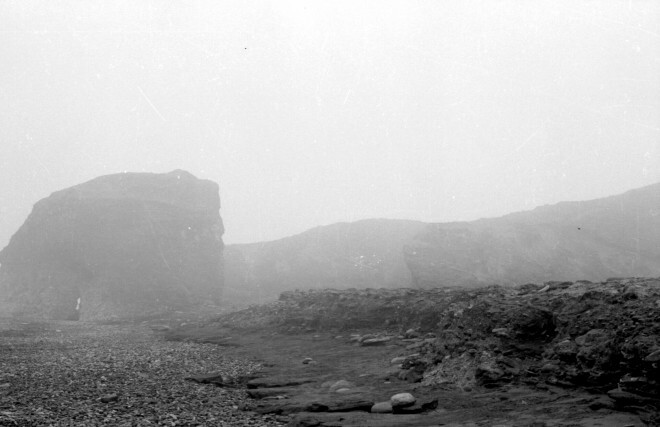 Blachall Rocks 1973. A sense of adventure, and a desire to see other parts of the world drove me along paths that led elsewhere; but I miss this positive side of life in the North East. This is why I keep returning, and this is why I now feel the need to paint there. The beach at Blackhall Rocks would no longer be suitable for a film like ‘Get Carter’; it’s more likely to be chosen for an episode of ‘The Famous Five’. I must admit that the ‘improvements’ there are a disappointment to me. The whole place has been cleaned up, the detritus taken away, the pit closed down, the striking concrete columns and overhead cable structure that deposited mine waste, via huge metal buckets, into the sea have been demolished, and the place features car parks and coastal footpaths with tasteful wooden signs leading you to the right places. The environmentalists, along with changing times, prefer tourists to those tough survivors. They have dismantled the microcosm and taken ownership now. These authorities have closed off the locals’ preferred routes and lead them to an inconvenient car park equipped with maps, information boards and litter bins, none of which they are in need of. In spite of all this, there is a residue of all the recent mining activity that makes it interesting to me as a painter. Blackhall Rocks on a chilly autumn evening. 2012. Sketchbook entry. 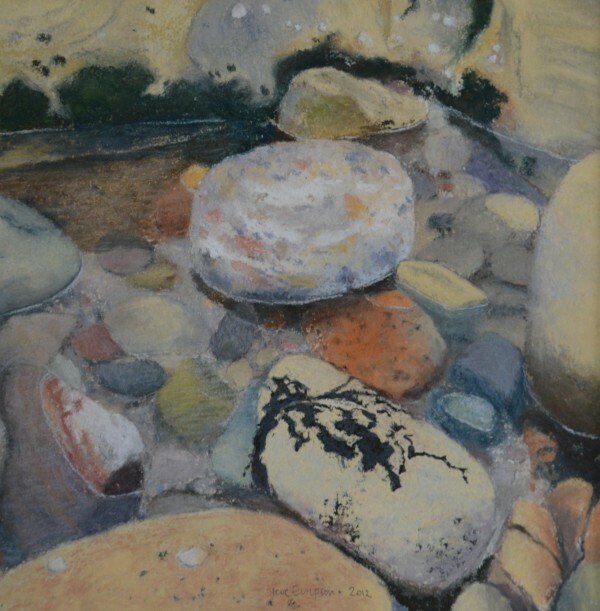 There is a superb range of rocks and pebbles on this beach, and a particular belt that has been affected by the leaching of the industrial waste, colouring the rocks an unlikely orange; juxtaposed strong ochres, and a belt of white and grey pebbles, then a band of Van Dyke brown sand; the beach takes on a surreal quality. The cliffs of Magnesian limestone are perforated with fantastic caves and blowholes – they support a unique flora and fauna. All of this was still there when the place was ‘desolate’, and that contradiction was one of its great attractions. Now it is called a ‘heritage coast’, it is a nature trail (as advertised in the brochures aimed at luring you to the Durham coast); it’s there for everybody to see, in its glory. For those few earlier adventurers, like myself, the elements of discovery and surprise have gone. The stones remain, and they are my subject. They have witnessed the passing of many eras, including the mines, and they will witness many more. New folk will find their own areas of interest here and come to regard this stretch as their own, for whatever reason. Beach at Blackhall Rocks. Mixed media. 2012. 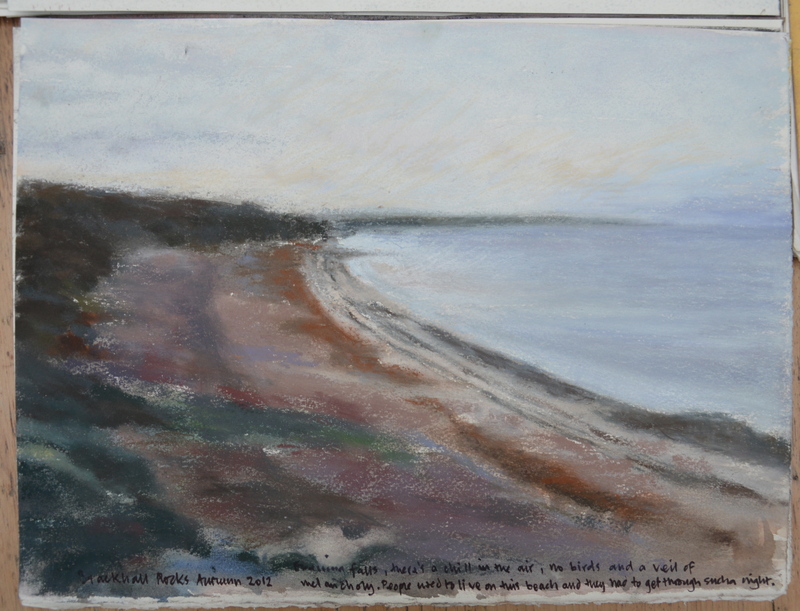 This tonal study of the beach is in pencil with watercolour applied afterwards, and then some pastel. 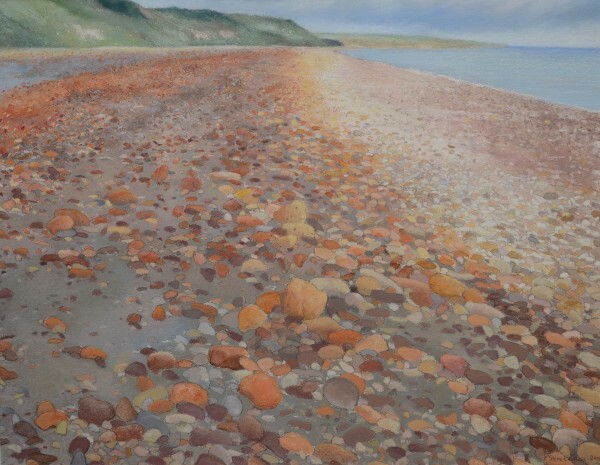 The beaches of Britain are covered by billions of stones and pebbles, so why do I want to paint these? 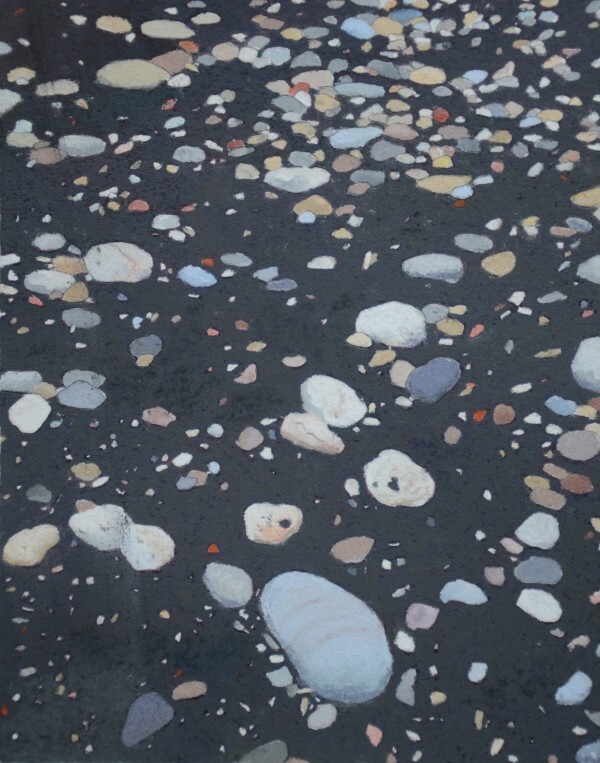 Sometimes I want to paint them just because they are stones on the beach, with their infinite arrangement of shape, pattern and texture. They change colour and mood with the changes of time and light, and the interest is therefore constantly renewed. 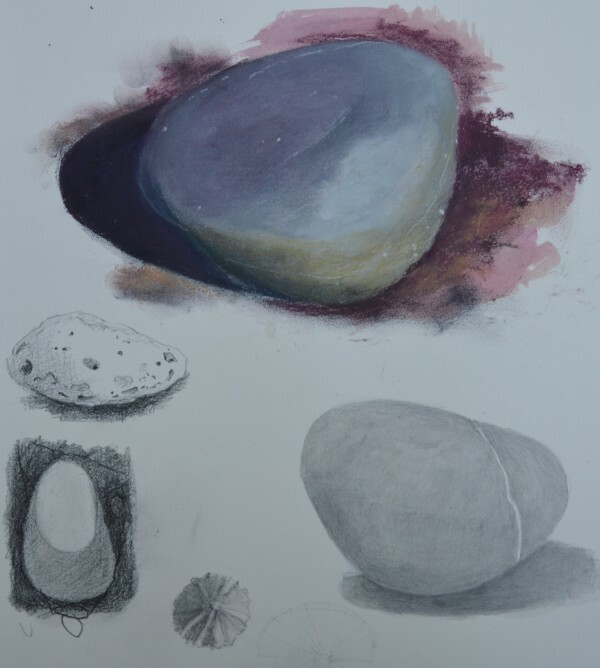 Studies of stones found on the beaches. Sketchbook entry. As I have already referred to, it is those that seem to be unique to this beach that I find most alluring, and so I embarked on a series of studies that led me to a new exploration of Blackhall Rocks beach. After the Colliery, mixed media. 2012. Whatever ghastly material was dumped here has leached into these rocks, rendering them, at their most outrageous, almost cadmium orange. The mining processes have led to a preponderance of finger-shaped, and saucer-shaped pebbles in raw umber and deep alizarin crimson. 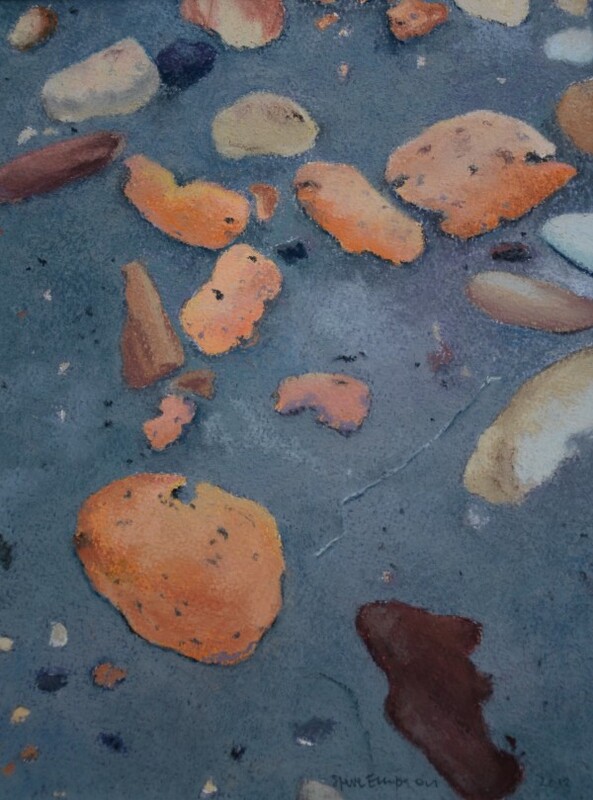 The strata of Magnesian limestone, prevalent in the cliffs and rock pools, is naturally a Naples yellow when split open, but because it’s here, you can add yellow ochre through to burnt Sienna. The closer you look, the greater the interest and the excitement, and some of the colour relationships soon struck me. There were areas of what seemed to be contaminated sand that took on a Payne’s Grey colour, which I wanted to set up against the unlikely oranges – that became the basis of the painting. Stones on blue sand at Blackhall. Sketchbook entry. 2012. The chance patterns of stones left by the tide each time it ebbed away, also interested me. 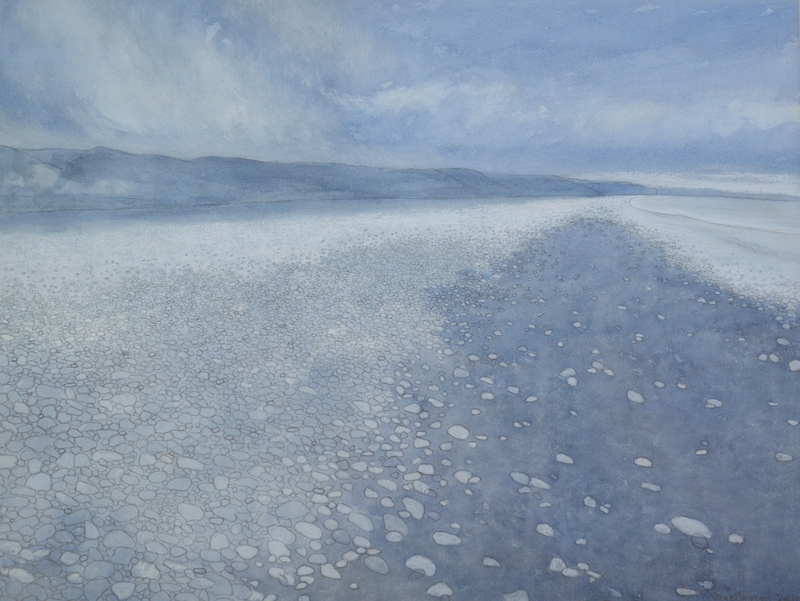 I spent many hours on this beach choosing the patterns I wanted to work with and I became something of an interest to the odd person passing by with a spade or a fishing rod, wondering why I might be staring into ‘nothing’ for such a long time. But then everyone just gets on with their own particular interest here, happy to briefly share conversation with each other, but not to the distraction of their own personal objective. My objective was to find arrangements that interested me. 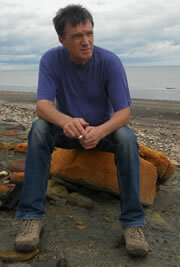 Moving to another part of the same beach offered new considerations. 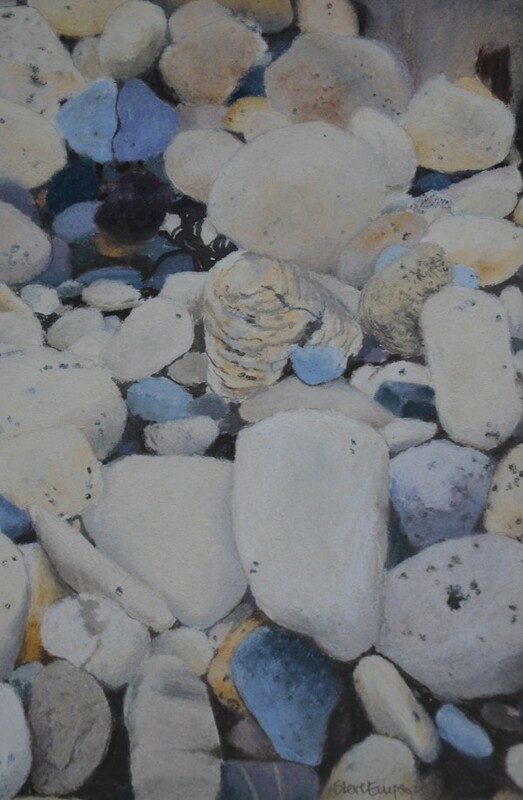 The Payne’s grey ‘contaminated sand’, threw up arrangements of light pebbles in blue and white with fragments of broken brick. It took millennia to create many of these objects and an instant to randomly throw them together on an incoming tide. Blackhall stones. Mixed media. 2012. The patterns of the tide create clusters of stones that are pushed and shoved, jostled around and sometimes, just nurdled into new positions. Each visit is new, so the beach holds an infinite interest, if you are of such an inclination. Harmoniously heaped together, this subtle shift of shape, colour and texture is an offering of nature. Free entertainment. Calming, strengthening, satisfying, beautiful and by many, unnoticed. Blue and white. Mixed media. 2012. The larger rocks at the shoreline capture these smaller stones and pebbles and spin them around like a washing machine twice a day, creating rockpools, ornamented by strands of black seaweed and green algae draped across the yellow Magnesian limestone. A piece of concrete, tempered by years of tides, stands in the centre like a dollop of tutti fruiti, crowning an ice-cream cone. Magnesian limestone. Mixed media. 2012. 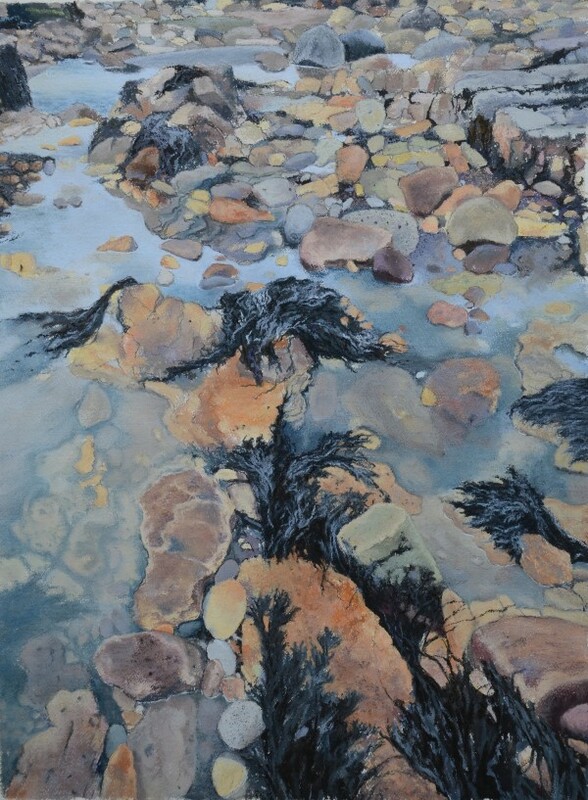 The residual pools of seawater, slowly leaking away, distort the colours and the form of the stones.They support clumps of handsome, tousled seaweed and an ecological microcosm, that lies within the old socio-economic microcosm that Blackhall beach used to be. What a place it is! There are many places, so go and find one, and I urge you to look closely, for that is what will turn it into a world that teaches you something, and a world that is yours. If Blackhall Rocks didn’t get Carter, it got me!